Caption slip reads: "Photographer: Sandusky. Date: 10-03. Assignment: Injured seal. D5, 6, 9, 10, l/r: Dep. Sheriff Walter penland and lifeguard Jack Jones. 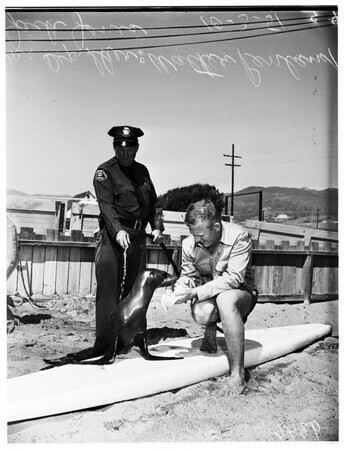 (Jones is LA County lifeguard, Zuma Beach).